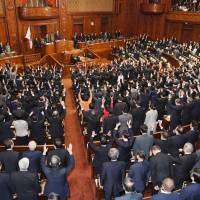 In a dramatic move sure to change the landscape of the nation’s politics, the center-left Democratic Party decided Thursday to effectively disband its Lower House caucus and join Kibo no To (Party of Hope), a new conservative party led by Tokyo Gov. Yuriko Koike. The effective sudden death of the nation’s largest opposition force could turn the Oct. 22 Lower House election into a two-way race between conservative forces: Prime Minister Shinzo Abe’s Liberal Democratic Party and Kibo no To. Public support for the DP has been dwindling for months, and the party was widely predicted to suffer a crushing defeat in the upcoming vote. 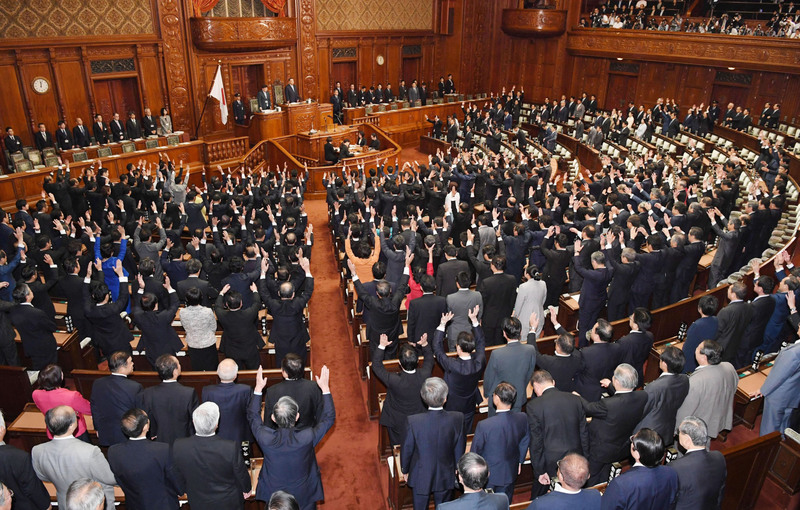 The proposal to shift allegiance to Koike’s movement, made by party president Seiji Maehara, was unanimously approved at a general meeting of DP lawmakers the same day. Under the plan, all DP candidates for the general election have been asked to abandon party membership and apply to join the official ticket of Kibo no To. But it remains unclear how many DP applicants will be accepted by Kibo no To. During a TV interview on Wednesday, Koike, a right-leaning conservative, said her party will choose applicants from the DP after close consideration of their views on constitutional revision and security issues. 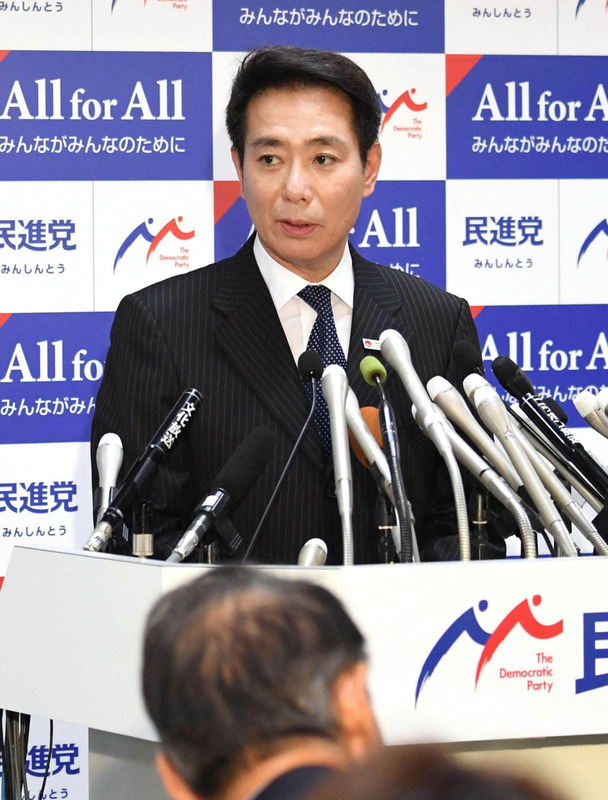 The comment has been interpreted as indicating that Kibo no To will refuse to accept left-leaning DP lawmakers. This means the powerful Lower House could be dominated by two major conservative parties after the Oct. 22 election, observers say. According to Maehara’s plan, the DP will give “full support” to Koike’s party in election campaigns, including financial support for former DP members running on the Kibo no To ticket. Upper House DP members will retain their party membership and organizations. How the DP’s Upper House caucus and Kibo no To will coordinate their policy platforms before the Lower House election has not yet been decided. Ruling-party lawmakers were quick to criticize Maehara’s move as political maneuvering that failed to secure agreement with Kibo no To on key policy points. “What’s really important is not the combination of parties, but what policy proposals they advocate. Voters are interested in that point and will judge accordingly” in the election, Chief Cabinet Secretary Yoshihide Suga told a news conference Thursday. Koike’s party, which was just launched on Monday, has so far advocated few concrete policy proposals in public, except for freezing the planned consumption tax hike planned for October 2019 and abandoning nuclear power at some point in the future. Maehara has argued that revenues from the tax hike should be used for free education and day care services for children. He also said 2015 security laws, which expanded the legal scope of Japan’s support for the U.S. military in times of crisis, are unconstitutional. But Koike has argued that the laws are needed to cope with the North Korean military threat. 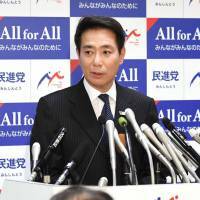 During a Thursday news conference, Maehara said he has reached agreement with Koike on some policy issues and is optimistic about forming consensus on security issues. He didn’t offer details. A senior DP member, who spoke on the condition of anonymity, said the focus of Maehara’s decision was to beat the LDP by avoiding overlap between candidates from the DP and Kibo no To in several constituencies. “Media people keep talking about ideals and policy proposals of a party in their reports. But this is about election tactics in fielding candidates,” the DP lawmaker said. Indeed, Abe apparently chose to dissolve the Lower House on Thursday to take advantage of the weak, disorganized opposition parties. Koike was believed to still be in the early stages of launching a national party, and support rates for the DP in media polls are lagging far behind those of the LDP. As of Thursday, Kibo no To had only 14 lawmakers and lacks a national organization to back its candidates. But by accepting former DP members as candidates, the party can receive support from the DP’s local organizational machine, including help from the Japanese Trade Union Confederation, the nation’s largest labor union body better known as Rengo. In return, DP members can take advantage of Koike’s popularity among voters. “I want to achieve substance, rather than care about the name (of the party) only,” Maehara told DP lawmakers during Thursday’s meeting. The predecessor of Democratic Party, formally called the Democratic Party of Japan, was set up in 1996 with founding members including former prime ministers Naoto Kan and Yukio Hatoyama. After absorbing the Liberal Party led by Ichiro Ozawa, the DP took power by besting an LDP-led coalition in the 2009 Lower House election. But the DP lost power in the 2012 general election after failing to meet a number of key election promises, including the drastic reorganization of the government budget.